The Q Knot from Rubbo International, Inc. was selected as a finalist Home Organization, Laundry & Non-Electrics Cleaning in the prestigious 2011 Housewares Design Awards. Called “the Oscars of home design,” the Housewares Design Awards is the premier awards competition focused on the housewares industry. Winners will be announced at the Housewares Design Awards presentation ceremony and luncheon on Wednesday, February 2, 2011 at the New York Marriott Marquis. Bundling multiple objects, organizing various cords, re-seal bags of chips/bread/dry pasta, and much more. Just strap and done. 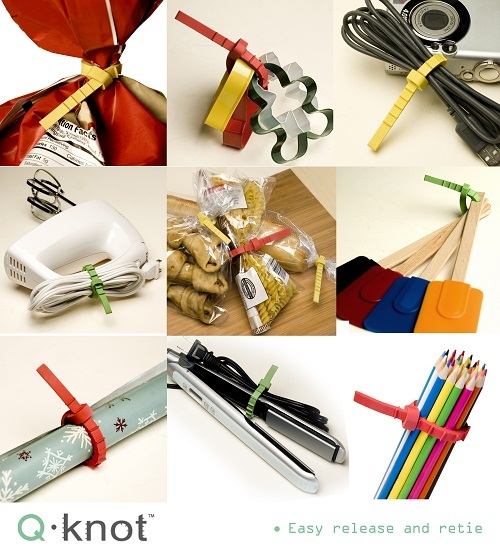 The smart self-locking design makes bundling small objects a piece of cake. An independent panel of judges selected Q Knot as the finalist based on superior design, appearance, function and originality. The Housewares Design Awards are presented by HomeWorld Business, with educational support from the International Housewares Association and sponsorship by the New York International Gift Fair®.